Looking like a crazy person never looked so good. We've all seen it before. That person that's talking in the car next to you, but there is no one else in the car. There are a few things you should think about when selecting the best bluetooth earbud for your new adventures in self-dialogue. When we crafted the Ghost we considered all the various aspects of the inner part of the ear. We asked ourselves, what would make an earpiece fit comfortably for long periods of time? It had to be comfortable for hours at a time. It had to fit just right, so that it wouldn't fall out. It had to be discrete, so it looked like your were talking to yourself. The resulting design was the master(ear)piece. The Ghost. >Cooking with both hands free - asking mom how to actually make the dish. >Playing with the kids - talking to your wife about how to keep them entertained for the next 5 hours before they go to sleep. >Doing work - while you secretly talk with your best friend. >Your next mission - as a top secret spy. >Driving - so you can use your other two hands to do important things like play with the radio and drink your latte. When you wear the Ghost you can count on crystal clear audio. Click "Add to Cart" and buy one today. NO WIRES, NO LIMITS - Truly wireless earphone offer unrestrained listening and convenience. No more dangling wires when working out, driving, playing sports, or at work. SUPERIOR HD AUDIO - Powered by a 8mm German speaker, our earbud offers the most powerful and crisp sound when listening to music or talking on the phone. UPDATED BATTERY + MAGNETIC USB CHARGER - 20 minutes provide 2 hrs of playtime. Includes a premium carrying case to store earbud and accessories. 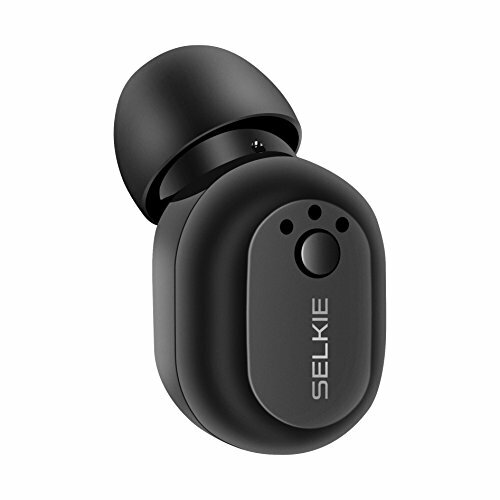 SECURE & LIGHTWEIGHT COMFORT - Ergonomically-designed earbud with 3 different sized ear tips ensure a secure and comfortable fit. Weighs just 3 grams and is barely noticable when in your ear.